My dogs Ace and Remy got to try the Wellness CORE dry dog food as well as two types of treats from Wellness (the Marrow Roasts and the Pure Rewards). These are all grain-free products made without meat by-products and without artificial preservatives, dyes or flavors. This post is sponsored by Wellness. Wellness is giving away a FREE Prize Pack to TWO readers of That Mutt. Each winner will receive two 4-pound bags of Wellness CORE dry dog food and a bag of each of the treats I mentioned. Leave a comment at the end of the post to enter. Drawing will take place Saturday March 18. Click here. *The winners have been chosen and notified. 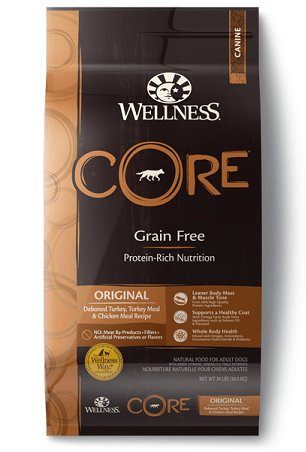 Wellness CORE is a grain-free line of food for dogs and cats including dry food, canned food, treats and air-dried raw food. In this post, we’re focusing on the dry dog food and the treats. The dry food from Wellness CORE is actually my go-to dry dog food brand so Ace and Remy are very familiar with Wellness CORE. They love it! I often feed my dogs raw food, but I always have dry dog food on hand. Wellness CORE is my top choice; we have it on autoship with Chewy. 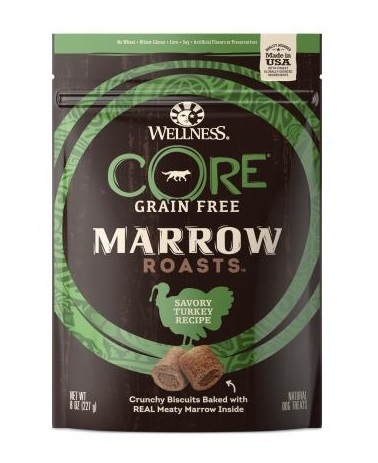 The Pure Rewards treats and the Marrow Roasts treats are grain-free treats made in the USA and high in protein. The Pure Rewards are soft (easy to tear) and perfect for doggie training sessions. The Marrow Roasts (pictured below) are soft biscuits perfect as a single reward or to stuff in a medium or small Kong. Ace and Remy love both these treats but really went nuts over the Pure Rewards. Your dogs can try these treats too. Just leave a comment below to enter our giveaway! Wellness CORE products are available online through Chewy.com, Petco, PetSmart, Amazon and more. What’s unique about Wellness CORE? There are a lot of dog food companies out there. Some I trust. Some I don’t. Wellness is a brand I trust. While it’s always good to read through the list of ingredients on any dog food or treats, I know everything in the Wellness CORE products are healthy for my dogs and cats. I’ve been using the brand for a long time. When I lived in Fargo, the locally owned natural pet food store carried Wellness products long before Petco and PetSmart offered healthier options. Wellness has a good reputation and is transparent. You can’t go wrong with that. The marketing on the packaging is accurate to the actual ingredients! The price of the food will be a bit higher if you’re used to a lesser-quality brand. Wellness offers so many food options overall (CORE is just one line) that it’s easy to get overwhelmed! I’ve stuck with the CORE line and have been happy with it. Would I buy this food? Yes, I already buy the Wellness CORE dry food for my dogs. I plan to keep buying it as it is my “go to” dry dog food brand. They also make dry and canned food for cats, for anyone interested. Would I recommend Wellness CORE to others? Yes. Wellness is a brand I trust, and I’ve fed their dry and canned food to my pets for years. I recommend the CORE products because I know the majority of dog owners prefer to feed dry dog food and this is a high-quality option. The food is grain free (no corn, soy, etc. ), high in protein and made with high-quality ingredients. Enter our giveaway below if your dogs would like to try Wellness CORE products! 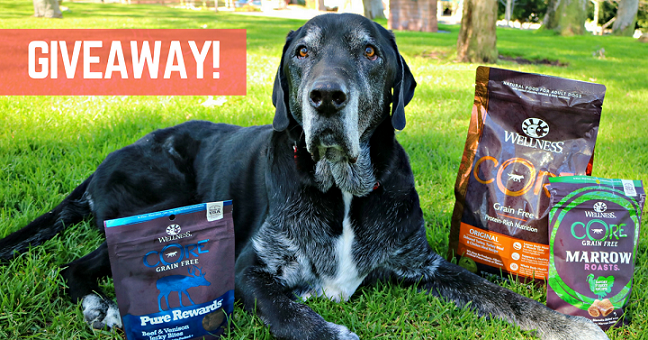 Giveaway – Win two bags of dog food and two bags of treats! *The winners have been chosen and notified. Wellness is giving away a FREE prize pack to TWO readers. Just leave a comment below to enter. Just leave a comment below to enter. Let me know why your dog is interested in the treats or food from Wellness. Must have a U.S. mailing address to win. I’ll choose the winners at random on Saturday March 18 and announce them in That Mutt’s email on Sunday. 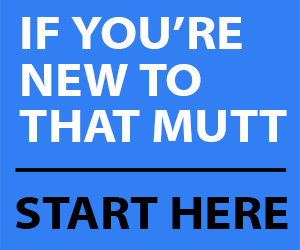 Sign up for That Mutt’s email digest HERE. Everyone signed up for the $7 reward or higher on That Mutt’s Patreon page receives automatic entries into ALL giveaways. There are still 4 spots remaining. Click here. Would your dog like to try Wellness CORE products? Kenji can be a picky eater and would certainly love this high-quality food! Would love to win! Wellness is great for my pup with allergies!! Chloe would love to try a better dry dof food that is made with better ingredients for her!! I’m always looking for better foods for her. She is a 9lb Mini Schnoodle, so she doesn’t go through bags of dog food fast. So, cost isn’t that much of an issue. Thank you for an opportunity to try this new product and give my dog a healthy food and treat she will love!! My dog Nakita would love to try these new foods. She is very finicky so finding the right food for her is difficult. She is also a bit overweight and her vet says she needs to lose a few pounds. I think that this food just might be what she needs. My dog loves the Marrow Roasts. Would love to try other products. I would like to try this with my dog. I am not happy with what we use now. He is a bit picky, and I am getting frustrated not finding what he likes. I’m a pet sitter and have big clientele of geriatrics and those with medical issues. Always looking for healthy treats and food to suggest to owners. Would love to try samples. My two rescued dogs would love some treats and dog food. They have no health issues and can eat all kinds of dry dog foods. Our canine family is at both ends of the spectrum. Jack is 12 and Molly is 10 months. We need these special needs addressed with our dogs. Thank you Wellness Core ! My husband and I have just added a Great Pyrenees puppy to our pack! She is now 11 weeks old and growing 😉 We have not yet tried Core products but would like to give her the best! My dog Roxie and I have been on the hunt for a dog food that she loves with a quality I approve of. I’ve heard lots of good things about the Wellness brand and we would love to give it a try and share what we think about it with our friends! My dog Roman would love to try some. Of course he is a puppy and eats anything, but this sounds like a very healthy food I wouldn’t mind him eating,lol. A friend of mine raved about Wellness foods that she fed her Maltese. At the time I had an Eng. Mastiff and 2 Golden Retrievers – couldn’t afford to feed Wellness. Now I only have a corgi mix to feed, and would love to try out Wellness Brand. My two Goldens LOVED the free sample I received of the Marrow treats! I would love to try the Wellness Core dry food as I have heard wonderful things about it. I am looking for treats that our large puppies will be interested enough in so we can use for training. My little pup, Daenerys isn’t thrilled about kibble. She loves “people” food but I’m afraid she’s not getting all the nutrition she needs from it. I’ve tried different brands but I’m still trying to find a brand she really likes…maybe this will be it! I would love to try this food for my dog Talou. He is on a grain-free diet because he has been having some skin issues lately. He loves the Pure Rewards treats but we haven’t tried the Marrow ones yet! I switched my pup from Nutro to Wellness Core. On Nutro, she was the pickiest eater and rarely finished her food. Now she actually finishes her food and is excited to eat. I would love for her to try the treats! Hello, I have two growing puppies that are almost ready to transition to a large breed dog food. Would like something natural and healthy. Thank you for considering me to try your brand. Murphy turned 1 year old in January, and we changed his food from puppy formula to adult in the same brand. Although he still eats it, he’s not in LOVE with it…grazing small amounts during the day. I think it’s time to try an different brand that still has the same high quality ingredients a dog needs. Thank you for this chance to try it!! I have a dog that is 11 years old that is always itching and a pit that has an very stinky tummy when she eats some dog food. I have just started to feed Wellness Core to my Service Dog. He seems to really like it. On his other food which was a quality food also, he just seemed hungry all the time. He is not that way on Wellness CORE at all. His coat looks awesome & he is doing awesome on this food! I have 5 picky dogs with allergies. It’s hard to find them great food that they will enjoy eating. I would love to try this with my pups! I recently rescued a dog thought to be about 18 months old. I also have a 7 month old puppy. Both are good eaters and I keep them on grain free food. Both wet and dry. Being a new pet owner I would love to know what food is best for their health. A sample of your product would be appreciated. I have heard great things about your food and I would love to win and see if my 2 picky eater pups would enjoy this. My girl Zoe loves Core dry food! I would Love to try your product, I have a 7 year old Mix Sheba. I like the fact that it’s Grain Free and the First ingredient is real meat. I have been feeding my rescue pup Taste of the Wild. She was very picky at first and when she took to it a just stuck with it. I would love to try a sample of Core since I have read so many good things about your products. Looking for something new and healthy for my two babies. Would love to try it!! I like that you can get these from Chewy, and I really want to try the treats with my pups. My dog would love to dry this dog food. He can not tolerate grain in his diet. My dog is a food snob and will only eat the best food. We are still looking for a good dry food for him. My puppy would love this dog food. Lambeau has had Wellness food before and he did well with it. We haven’t tried the treats, so this would be a good thing for him. 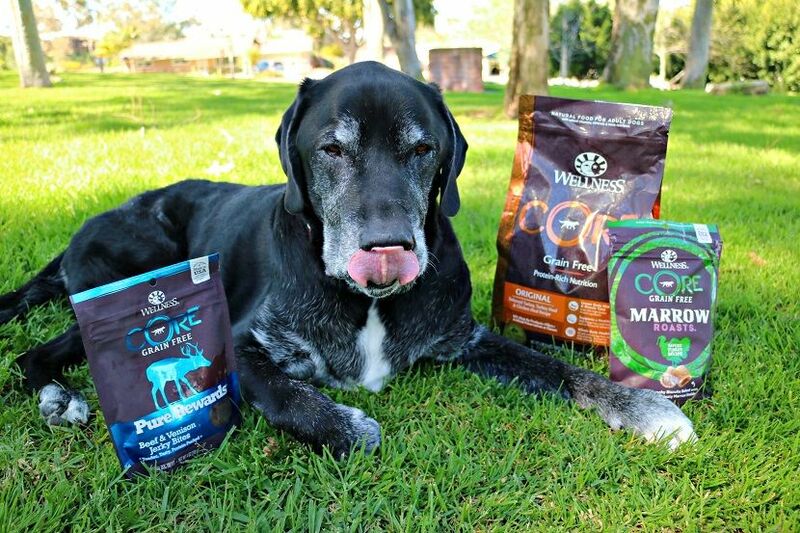 I only feed Posey grain free products so I would love to try Wellness Core food and treats. wellness is an excellent product. i use the Holistic Select which is made by wellness now. my dog breeder introduced it to me and the girls love it. they make no grain, organic and they love the sardines and fish. i have called them several times for questions and coupons and their customer service is excellent. if you sign up for their emails they send you coupons every month. the wellness treats are very nice as well. so my girls would love to try Wellness since they already like one of the products. Izzy would love to try some good food that has meat as its first ingredient and it’s readily available where we shop!